NASA and the Department of Defense Human Space Flight Support (HSFS) Office have a long history in preparing for human spaceflight missions. As NASA’s Commercial Crew Program prepares to begin launching astronauts once again from American soil, it is vital teams prepare for launch day operations, including possible but unlikely emergency scenarios, and simulations are key to getting teams as ready as possible. 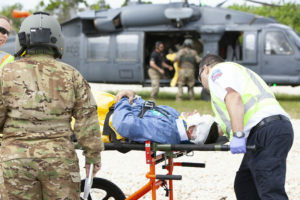 Today, teams from NASA, HSFS and SpaceX are conducting a joint medical triage and medical evacuation (medevac) training exercise at NASA’s Kennedy Space Center in Florida. This is the second of two emergency medical services simulations to be performed before commercial crew flight tests, which are scheduled for 2019. The first exercise was conducted at Space Launch Complex 41 and integrated teams from NASA, Boeing and United Launch Alliance. For today’s exercise, teams are practicing a worst-case scenario, pad emergency and subsequent hypergolic fuel leak. Starting at the base of the egress system at Launch Complex 39A, volunteer ground crews are evacuating the pad perimeter using three Mine Resistant Ambush Protected, or MRAP, vehicles. Three helicopters, emergency services, and the triage team are meeting the evacuated crews at triage site 8, between Launch Pads 39A and B. 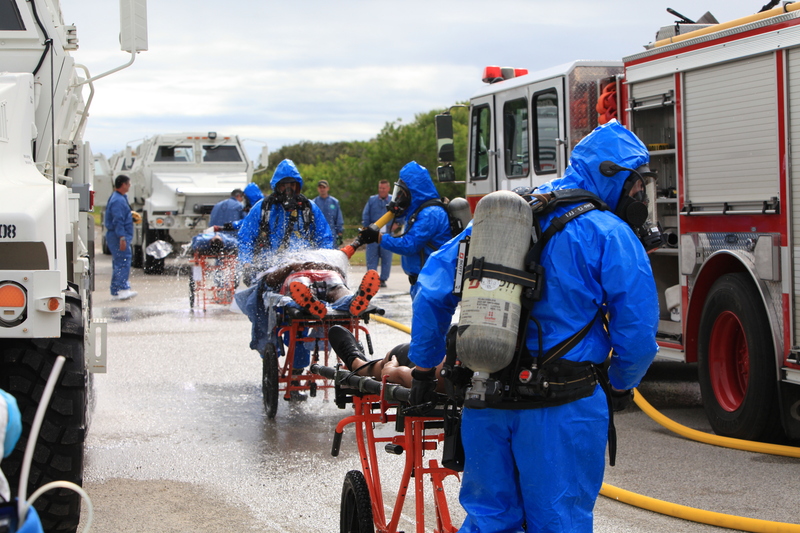 As part of this exercise, evacuated personnel are undergoing a toxic vapor check. Kennedy Fire/Rescue teams are treating the crews as if contamination were detected and are performing decontamination measures. Following the medical evaluations, the simulated patients are being stabilized and prepared for transport. Selected patients are being evacuated to several area hospitals in order to validate all emergency procedures. This simulation is a recent example of how safety is being built into systems, processes and procedures. These simulations are designed to exercise various components of emergency procedures, as well as triage and medevac response during the unlikely event of an emergency during launch operations. It is standard practice to conduct these exercises, and was regularly done during the Space Shuttle Program.